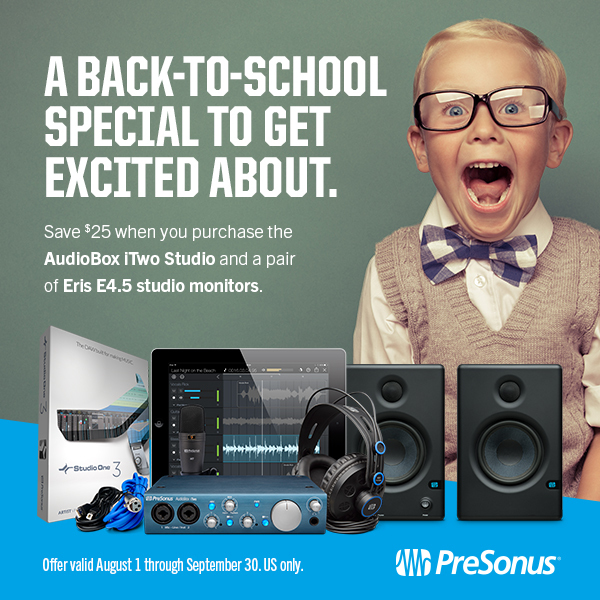 Back To School Sale: Eris 4.5 Monitors and iTwo Studio–Save $25! It’s August which means the first day of school is right around the corner. Why not start the school year right with a complete recording solution that’s perfect for dorm rooms, bedrooms, and can even be taken on the go? You can also enhance your set up with studio quality sound that fits nicely in a student’s budget (and space). Now, through September 30th we’re offering $25 savings on the AudioBox iTwo Studio and our Eris E4.5 studio monitors. The AudioBox iTwo Studio is convenient, portable, bus-powered USB 2.0 and iPad® audio and MIDI interface that offers two combo mic and switchable line and instrument inputs allowing you to record in your dorm room or anywhere on campus with a Mac®, PC, or iPad. Also included Studio One Artist, Capture and a Nimbit account! Check out this overview video from Guitar Center below. If you think back-to-school deals are just for parents and students, you may be missing out some awesome deals! We’d love to fully stock up your dorm room, class room and studio with this deal! This offer is available only in the US–Click here to find your local dealer! Posted in Monitoring, Promo / Discount, Recording Systems | Comments Off on Back To School Sale: Eris 4.5 Monitors and iTwo Studio–Save $25!